Nanocoating is the process of depositing a thin layer of coating material, generally of <100nm, on a substrate to improve the latter’s properties or add new functional properties. Nano-coated materials exhibit features such as toughness, wear resistance, optical transparency, and high hardness. Nanostructured coatings provide various key advantages such as protection from ice, pollutants, UV rays, fire, heat, bacteria, marine life, and corrosion. These performance benefits offered by nanocoatings compared to other coating systems are anticipated to boost the nanocoatings market. Nanocoatings cater to a wide range of end-user industries such as health care, automotive, aerospace, energy, marine, and food & packaging. Expansion in end-user industries is expected to propel the market in the near future. However, emission of VOCs during the use of nanocoatings is anticipated to hamper the market. Volatility in prices of raw materials is also estimated to negatively impact the nanocoatings market. Nevertheless, technological advancements and significant investments in end-user industries in emerging economies offer lucrative opportunities to the nanocoatings market. The nanocoatings market has been segmented based on type, end-user, and region. Based on type, the market has been classified into anti-fingerprint, anti-microbial, anti-corrosion, abrasion & wear resistant, anti-fouling/easy-to-clean, self-cleaning (bionic), self-cleaning (photocatalytic), UV-resistant, anti-icing, thermal barrier & flame retardant, and conductive. In terms of value, self-cleaning (photocatalytic) was the major segment of the nanocoatings market in 2017, owing to its wide usage in electronic and medical devices. Based on end-user, the global nanocoatings market has been divided into health care, aerospace, automotive, textiles, construction, electronics, food & packaging, energy, marine, and others (including household, water treatment, and tools & engineering). The health care segment is estimated to expand at a faster pace than other segments, as various types of nanocoatings such as anti-microbial, easy-to-clean and self-cleaning are applied on medical devices. In terms of region, the global nanocoatings market has been segregated into North America, Europe, Asia Pacific, Latin America, and Middle East & Africa. North America accounted for prominent share of the global nanocoatings market in 2017. It was followed by Europe, Asia Pacific, Middle East & Africa, and Latin America. However, Asia Pacific is projected to be a rapidly growing region of the market during the forecast period. Europe is likely to constitute significant share of the market during the forecast period. High degree of competition exists among players operating in the global nanocoatings market. Dominated by large players, the market is moderately consolidated. Key players account for major share of the market. Prominent players profiled in the report are Bio-Gate AG, Buhler PARTEC GmbH, Cima NanoTech Inc., Eikos Inc., Inframat Corporation, Integran Technologies Inc., Nanofilm Ltd., Nanogate AG, Nanophase Technologies Corporation, and Nanovere Technologies LLC. Nanocoatings are materials that are manufactured by shrinking raw materials at the molecular level to form a denser product. They are manufactured from various raw materials such as epoxies, urethanes, carbon, and metals. Nanocoatings offer characteristics such as scratch resistance, enhanced surface appearance, UV and chemical resistance, thermal and electrical conductivity, easy-to-clean surfaces, and color and gloss retention. Additionally, nanocoatings are ideal due to the low maintenance and anti-corrosion properties. Based on type, the global nanocoatings market has been segmented into anti-fingerprint, anti-microbial, anti-corrosion, abrasion & wear resistant, anti-fouling/easy-to-clean, self-cleaning (bionic), self-cleaning (photocatalytic), UV-resistant, anti-icing, thermal barrier & flame retardant, and conductive. 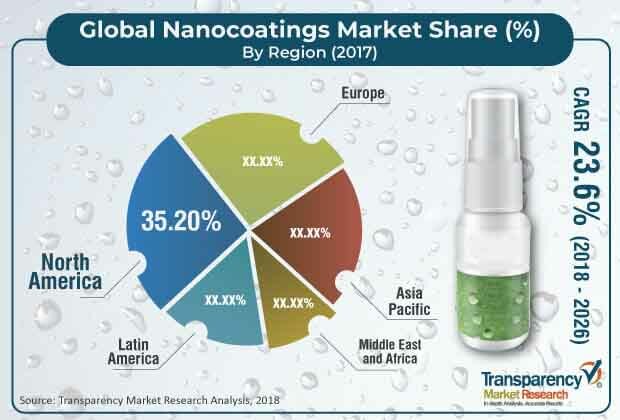 In terms of end-user, the nanocoatings market has been divided into health care, aerospace, automotive, textiles, construction, electronics, food & packaging, energy, marine, and others (including household, water treatment, and tools & engineering). Based on region, the global nanocoatings market has been segregated into North America, Europe, Asia Pacific, Latin America, and Middle East & Africa. North America held prominent share of the global nanocoatings market in 2017. The U.S. accounted for major share of the nanocoatings market in North America in 2017 due to the rise in demand for nanocoatings in end-user industries such as construction, automotive, energy, textiles, and marine in the country. Expansion in the residential construction industry in the U.S. and the ongoing renovation activities of buildings are expected to drive the market in the near future. The report analyzes and forecasts the nanocoatings market at the global and regional levels. The market has been forecast in terms of volume (tons) and revenue (US$ Mn) from 2018 to 2026. The study includes drivers and restraints of the global nanocoatings market. It also covers the expected impact of these drivers and restraints on demand for nanocoatings during the forecast period. The report also highlights growth opportunities for the nanocoatings market at the global and regional levels. The report comprises detailed value chain analysis, which provides a comprehensive view of the global nanocoatings market. The Porter’s Five Forces analysis model for the nanocoatings market has also been included to help understand the competition landscape. The report also includes the analysis of various types and end-user segments based on their market size, growth rate, and segment attractiveness. These segments have been analyzed based on the present and future trends. Regional segmentation includes the current and future demand for nanocoatings in North America, Europe, Asia Pacific, Latin America, and Middle East & Africa. The report also covers segmentation based on individual type and end-user segments of the market in all the regions. The study includes profiles of major companies operating in the global nanocoatings market. Key players profiled in the report are Bio-Gate AG, Buhler PARTEC GmbH, Cima NanoTech Inc., Eikos Inc., Inframat Corporation, Integran Technologies Inc., Nanofilm Ltd., Nanogate AG, Nanophase Technologies Corporation, and Nanovere Technologies LLC. Market players have been profiled in terms of company overview, business strategies, and recent developments. The report provides size (in terms of volume and value) of the nanocoatings market for the base year 2017 and the forecast for the period between 2018 and 2026. The size of the global nanocoatings market has been provided in terms of volume and revenue. Market numbers have been estimated for type, end-user, and regional segments. The market size and forecast for each type, end-user, and regional segment have been provided for the global and regional markets.